Apple today released the third beta of iOS 6, the company's next-generation mobile operating system set to launch "this fall", presumably alongside new iPhone hardware in the September-October timeframe. The third beta, which arrives as Build 10A5355d, comes three weeks after the previous developer version of Build 10A5338d. We'll update this post with additional information on the new release as it surfaces. Users are tracking new changes both in the forum thread associated with this article and in this thread. 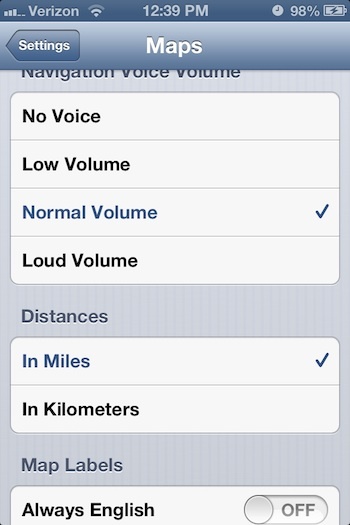 One key addition observed so far is a new section in the Settings app for Maps, allowing users to change the volume of the navigation voice, set distances to display in miles or kilometers, set map labels to display either in the local language or always in English, and set map label sizes to either "normal" or "large". Update: Also released today: Xcode Developer Preview 3 and Apple TV Software beta 3.
people installing without reading the release notes... Scary. What are the release notes going to say to stop anyone from installing? *In this version nothing works. We have fixed no bugs since the last version, and in fact have made the battery life worse. If you have Beta 2 it's a no brainer to upgrade regardless of what the release notes say. Non Developers, are you really going to pay $99 to get iOS 6 early? I haven't been this excited about iOS since introduction of the App Store! Well it's not just iOS I'm excited about. It's the combination of iOS 6 and Mountain Lion and iCloud. First time I will feel like I have a nicely integrated experience whether in the office or mobile between all my computers and devices. I've seen plenty that do and then they complain when all the features don't work as advertised. People need to understand what a pre-release is. Beta versions will have bugs and other issues. You will have incompatibilities and other problems. Beta 3, this usually means it's pretty much ready, right? Usually? We have a ways to go. October is probable. You could brick your device.